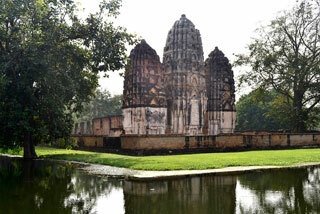 Sukhothai was the capital of the first Kingdom of Siam in the 13th and 14th centuries. It has a number of fine monuments, illustrating the beginnings of Thai architecture. The great civilization which evolved in the Kingdom of Sukhothai absorbed numerous influences and ancient local traditions; the rapid assimilation of all these elements forged what is known as the 'Sukhothai style'. This article uses material from UNESCO World Heritage List article "Sukhothai Historical Park", which is released under the Creative Commons Attribution-Share-Alike 3.0 IGO License.